Though 2012’s Jack Reacher didn’t exactly soar at the box office, it did just well enough to spawn a sequel. That leads us to 2016’s Jack Reacher: Never Go Back. Former US Military Army Military Police Corps officer Jack Reacher (Tom Cruise) quit the force in his 30s and became a roaming vigilante who tries to right wrongs – usually through violent methods. After a tip from current MP Major Susan Turner (Cobie Smulders), Jack shuts down a human trafficking organization. Jack and Susan flirt a bit on the phone, and he decides to visit her in DC. However, before Reacher arrives, Susan gets framed for espionage and imprisoned. Jack seeks to assist her, a task that leads to his own imprisonment – briefly, at least as Jack breaks both Susan and himself out of the hoosegow. They go on the lam as they try to clear both their names, a pursuit that also involves Samantha Dayton (Danike Yaroshi), a 15-year-old who may or may not be the daughter Reacher never knew he had. Although I liked 2012’s Reacher, I can’t say I thought it excelled, so I went into Never Go Back without terrific enthusiasm. While I thought it showed potential – mainly due to a good trailer that highlights the film’s opening scene – I didn’t expect greatness from it. And that level of anticipation holds true. At its best, Back provides decent action, but the movie seems less coherent than I’d like and it never quite connects. Some of the problem comes from the muddled overall storyline. The scandal involved in Back actually isn’t all that complicated, but the movie tells this tale in such a loose manner that it doesn’t make a lot of sense. By the finale, you can probably figure out who did what to whom and why, but it all remains poorly delineated. That isn’t a huge issue, but it’s just enough to make the film moderately off-putting much of the time. With so many confusing plot complications, it becomes more difficult to invest in the characters – we spend too much time scratching our heads about story elements to dig into the roles as much as we should. Not that I’ll claim Back develops the personalities especially well. Reacher develops a little more of an emotional core, but a lot of the character movement feels contrived. Susan and Sam exist solely to prompt something more than coldness in Reacher, and they succeed to a degree, but they usually feel more like plot devices than actual people. Back does manage some fairly solid action scenes. Now well into his 50s, Cruise still looks great and plays the fights in a convincing way. Smulders provides nice badass charm as Susan, too – her fight moments can seem forced and gratuitous, but she sells them. All of these factors lead to a watchable movie that rarely becomes especially engaging. While Never Go Back comes with moments of excitement, the end result lacks cohesion and seems mediocre. 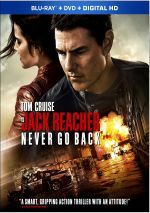 Jack Reacher: Never Go Back appears in an aspect ratio of approximately 2.40:1 on this Blu-Ray Disc. The Blu-ray replicated the source well. No complaints accompanied the good Dolby Atmos soundtrack of Never Go Back. Downloaded to Dolby TrueHD 7.1, the soundscape often opened up in a dynamic manner and used all the channels to positive advantage. Various vehicles zoomed around the room and guns peppered the soundscape to solid effect, so the soundfield added to the experience. No issues with audio quality emerged. Speech remained natural and distinctive, without edginess or other issues. Music was bold and dynamic, and effects killed. Those elements were expressive and impactful, as they showed fine definition and power. While not one of the best soundtracks I’ve heard, this was a very good mix. A smattering of featurettes fill out the disc, and these open with Reacher Returns. It lasts 11 minutes, 31 seconds and presents info from actor/producer Tom Cruise, author Lee Child, director/writer Edward Zwick, producer Don Granger, and screenwriter Marshall Herskovitz. “Returns” looks at the source novel and its adaptation as well as story/character domains. Much of this feels banal, but we get enough insights about the book’s leap to the screen to make it watchable. With An Unexpected Family, we get a 14-minute, 31-second piece with Zwick, Granger, Child, Cruise, Herskovitz, executive producer Herbert W. Gains, and actors Colbie Smulders, Danika Yarosh and Patrick Heusinger. This one tells us more about characters as well as cast and performances. Like “Returns”, “Family” mixes in a few insights but it usually feels superficial. Next comes Relentless: On Location In Louisiana. This one runs 25 minutes, 46 seconds and provides remarks from Cruise, Granger, Zwick, Gains, Hodge, Child, Herskovitz, Smulders, Heusinger, Yarosh and production designer Clay Griffith, and 2nd unit director/stunt coordinator Wade Eastwood. Though it also looks at stunts and action, “Relentless” mainly focuses on sets and locations. Despite some happy talk – seemingly unavoidable in featurettes for Cruise movies - the show offers a pretty good look at its topics. During the 12-minute, 42-second Take Your Revenge First: Lethal Combat, we find a piece with Cruise, Zwick, Hodge, Gains, Smulders, Heusinger, Granger, stunt fight coordinator Wolfgang Stegemann and actor Holt McCallany. As expected, “Revenge” examines stunts, with an emphasis on physical fights. It provides a reasonable overview. No Quarter Given: Rooftop Battle fills eight minutes, 13 seconds with statements from Cruise, Zwick, Griffth, Granger, Eastwood and Heusinger. Like “Revenge”, “Given” concentrates on physical stunts, but it highlights one particular sequence. This turns into another useful little piece. 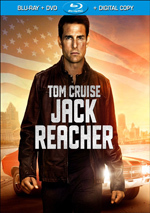 Finally, Reacher in Focus takes up eight minutes, 33 seconds and features Cruise and photographer David James. We learn about the photographer’s work and his relationship with the actor. Some decent notes about James’ career emerge but we get too much of the usual praise for Cruise. A second disc provides a DVD copy of Back. Beyond some previews, it lacks any extras. The package also throws in an illustrated short story. This gives us a tale from Lee Child that comes with some art as well. It becomes a fun addition to the set. Although the first film offered pretty good entertainment, Jack Reacher: Never Go Back feels less effective. It comes with a few effective action scenes but lacks much to make it better than mediocre. The Blu-ray delivers very good picture and audio along with a moderately informative package of bonus materials. Never Go Back seems serviceable and that’s about it.